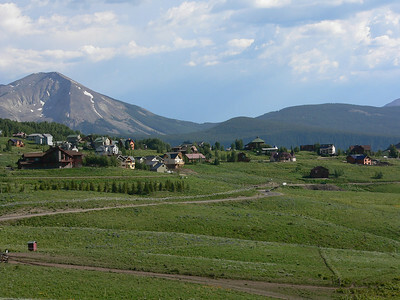 Travel - by car, train, boat- Click for (places) Add COMMENTS! In southwestern Colorado lies a deep narrow canyon befitting a National Park. 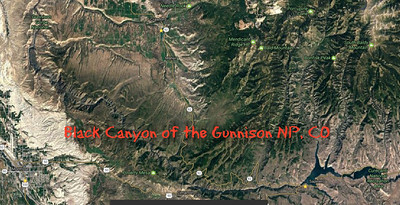 Stop to see it if you pass near Gunnison, Colorado. 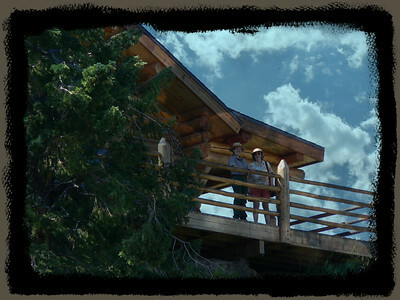 We finally made it on our SLC trip in 2005 with the Bergseths. 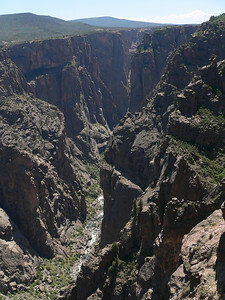 Like the Grand Canyon this one is probably more beautiful seen from the bottom. 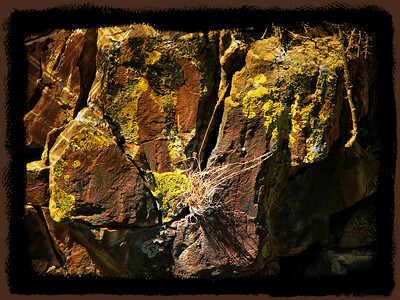 I'd like to do it one day. 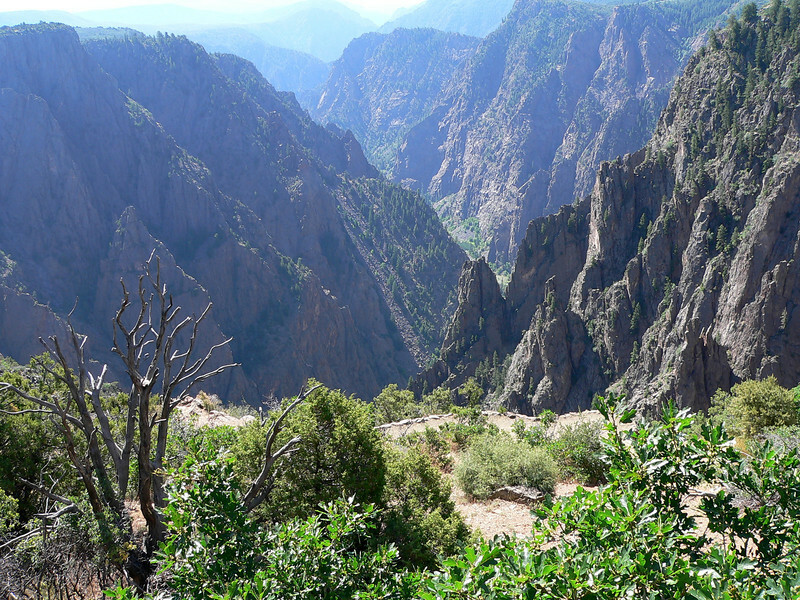 You need to see it to appreciate the awesome splendor of this gorge. 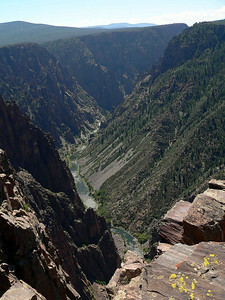 Black Canyon of the Gunnison NP, CO - 2005 Big enough to be overwhelming, still intimate enough to feel the pulse of time, Black Canyon of the Gunnison exposes you to some of the steepest cliffs, oldest rock, and craggiest spires in North America. 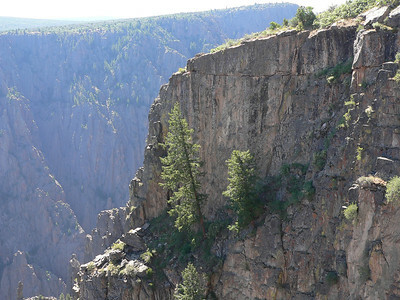 With two million years to work, the Gunnison River, along with the forces of weathering, has sculpted this vertical wilderness of rock, water, and sky. 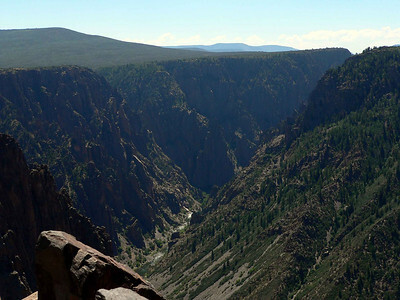 Deep, Steep and Narrow Big enough to be overwhelming, still intimate enough to feel the pulse of time, Black Canyon of the Gunnison exposes you to some of the steepest cliffs, oldest rock, and craggiest spires in North America. 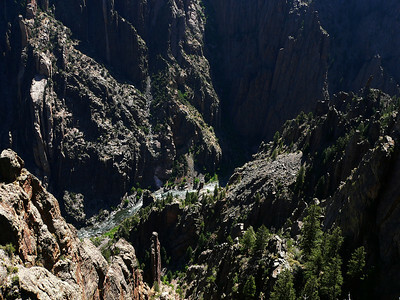 With two million years to work, the Gunnison River, along with the forces of weathering, has sculpted this vertical wilderness of rock, water, and sky. 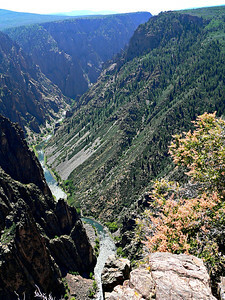 Black Canyon of the Gunnison National Park is a United States National Park located in western Colorado and managed by the National Park Service. 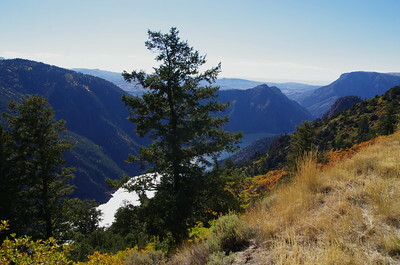 There are 3 entrances to the park. 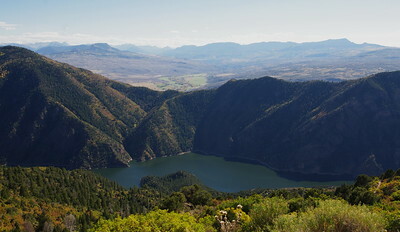 The more-developed east entrance is located 37 miles east of Montrose and just west of Blue Mesa Reservoir by Blue Mesa Point. 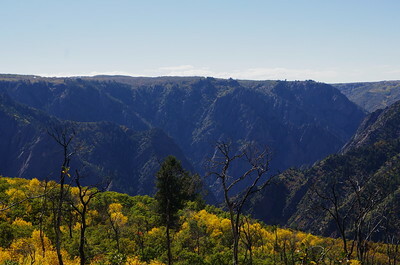 The south rim entrance is located 15 miles east of Montrose, while the north rim entrance is 11 miles south of Crawford and is closed in the winter. 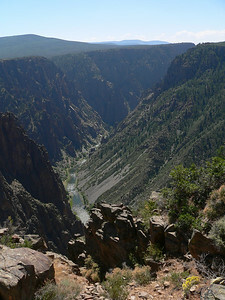 The park contains 12 miles of the 48-mile long canyon of the Gunnison River. 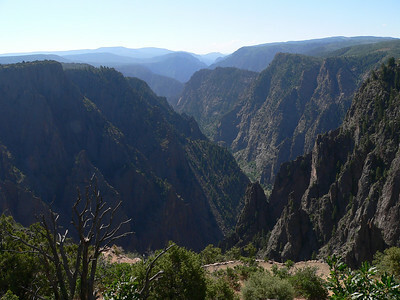 The national park itself contains the deepest and most dramatic section of the canyon, but the canyon continues upstream into Curecanti National Recreation Area and downstream into Gunnison Gorge National Conservation Area. 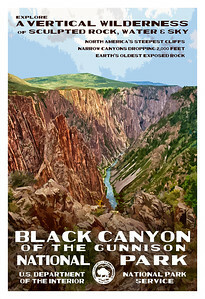 Black Canyon of the Gunnison National Park is a United States National Park located in western Colorado and managed by the National Park Service. 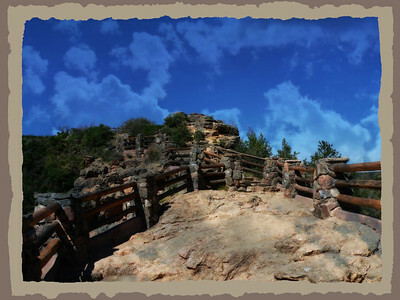 There are 3 entrances to the park. 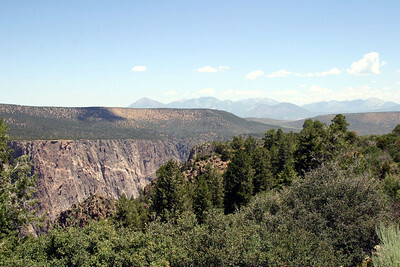 The more-developed east entrance is located 37 miles (59 km) east of Montrose and just west of Blue Mesa Reservoir by Blue Mesa Point. 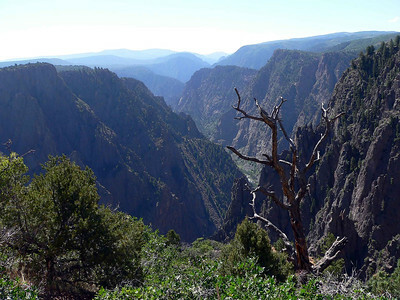 The south rim entrance is located 15 miles (24 km) east of Montrose, while the north rim entrance is 11 miles (18 km) south of Crawford and is closed in the winter. 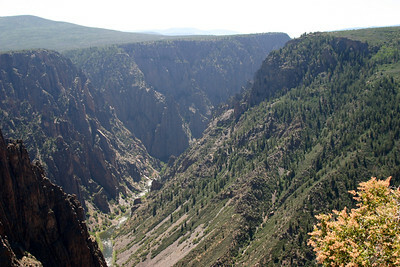 The park contains 12 miles (19 km) of the 48-mile (77 km) long canyon of the Gunnison River. 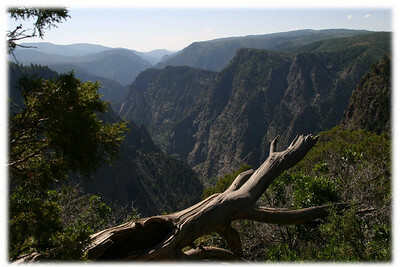 The national park itself contains the deepest and most dramatic section of the canyon, but the canyon continues upstream into Curecanti National Recreation Area and downstream into Gunnison Gorge National Conservation Area. 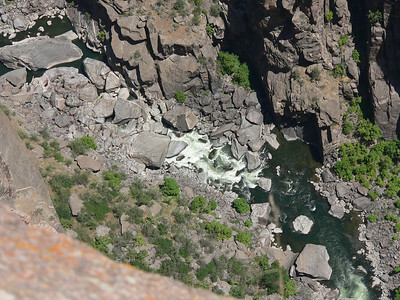 The Gunnison River drops an average of 34 feet per mile (6.4 m/km) through the entire canyon, making it the 5th steepest mountain descent in North America. 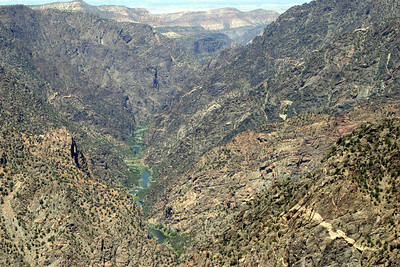 By comparison, the Colorado River drops an average of 7.5 feet per mile (1.42 m/km) through the Grand Canyon. 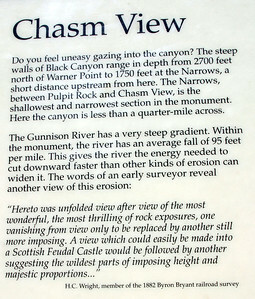 The greatest descent of the Gunnison River occurs within the park at Chasm View dropping 240 feet per mile (45 m/km). 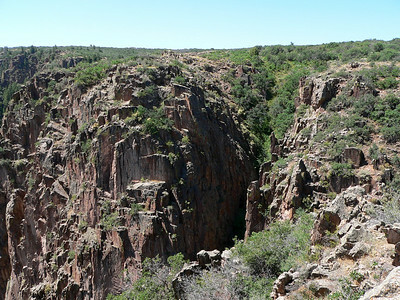 The Black Canyon is so named due its steepness which makes it difficult for sunlight to penetrate into its depths. 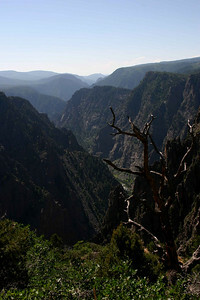 As a result, the canyon is often shrouded in shadow, causing the rocky walls to appear black. 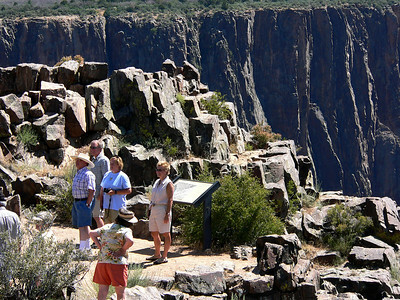 At its narrowest point the canyon is only 40 ft (12 m) wide at the river. 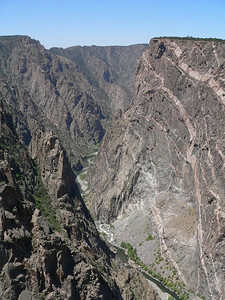 The extreme steepness and depth of the Black Canyon formed as the result of several geologic processes acting together. 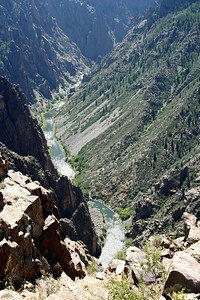 The Gunnison River is primarily responsible for carving the canyon, though several other geologic events had to occur in order to form the canyon as it is seen today. 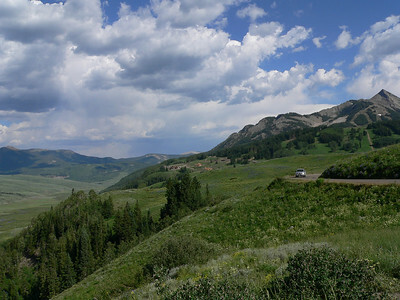 A loong detour for less than exciting views. 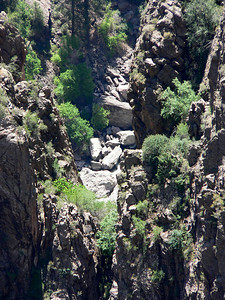 There are only a couple of places where you actually see the canyon bottom. 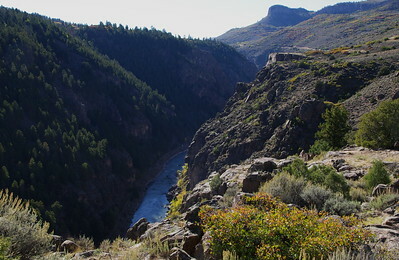 The road is too far back from the rim. 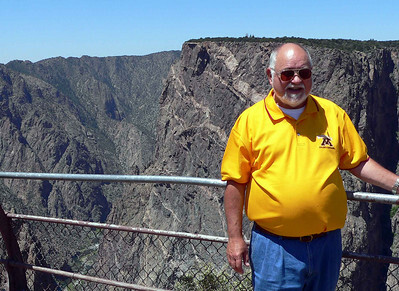 Stick to the south rim. Black Canyon- Views from Hwy 92 are minimal- to see the Canyon tour the park from Hwy 50 - its a nice drive, but not spectacular. 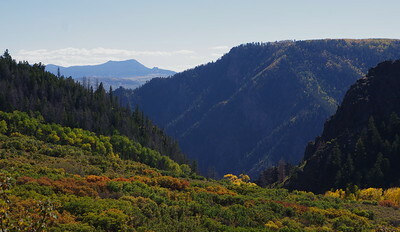 The best views are from the main park entrance north of Hwy 50. 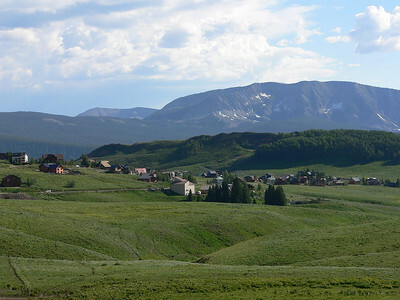 We tried Hwy 92 on the north side in 2015 and were not impressed.